Joe Dumars – general manager of the Pistons – recently offered some thoughts on why the Pistons have struggled in 2010-11. According to Dumars, the problem is an “inability to close out games”, which is related to the number of new faces employed by the Pistons. 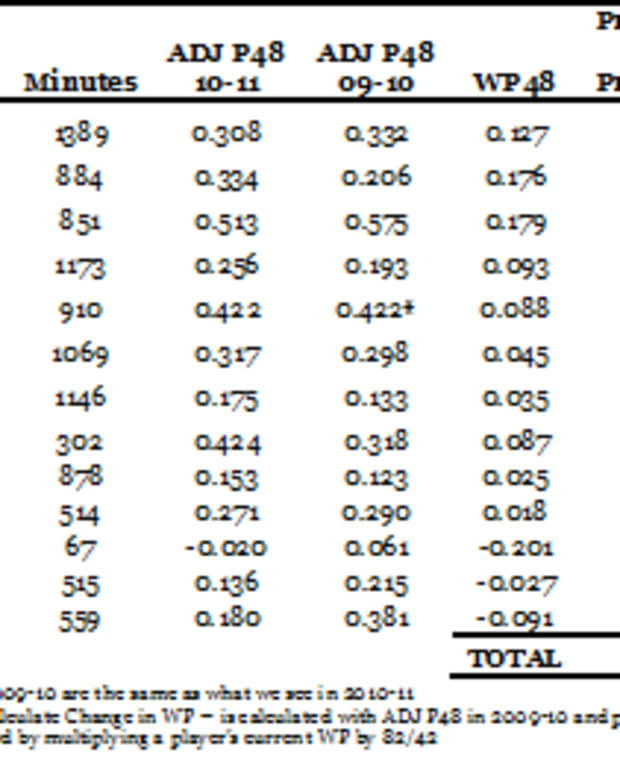 Of course, the Pistons – relative to last year – only have two new faces (Tracy McGrady and Greg Monroe). But only five players remain from the 2008-09 team. And there are only three players left from the team that took the title in 2004 (and none from the team that won the title in 1990). Yes, if you go back far enough you can discover that these players are entirely new to the Pistons. Update: Ben has also noted the problems with what Dumars has recently said. One week into the young season, this team looked like it could lose all 82; in the midst of that dismal beginning, I offered some analysis that suggested the Pistons might win 34 games (or be a .415 ball club). After 10 games, the Detroit Pistons are 4-6 (or a .400 ball club). Yes, the sample is small, but our record thus far corresponds with what I anticipated in terms of winning percentage and record. However, the performances of individual players doesn’t, at least not in every case. 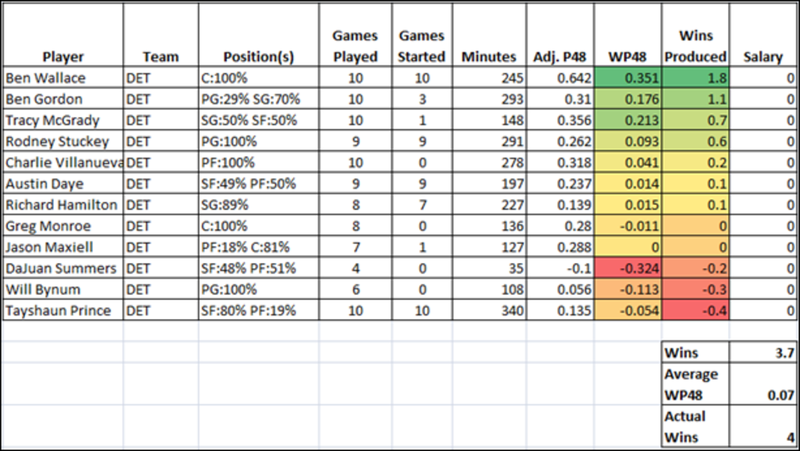 Here’s what the Automated Wins Produced Numbers tell us about the players’ performance through 10 games. I thought an interesting approach to reviewing the team after 10 games would be to revisit some of my thoughts about individual players to see what I got right and what I got wrong. Complete box score stats here, courtesy of Basketball-Reference.com. Rodney Stuckey: Will the real Rodney Stuckey please stand up? Or thinking pessimistically, is he already standing? After a blistering start, Stuckey has regressed significantly. 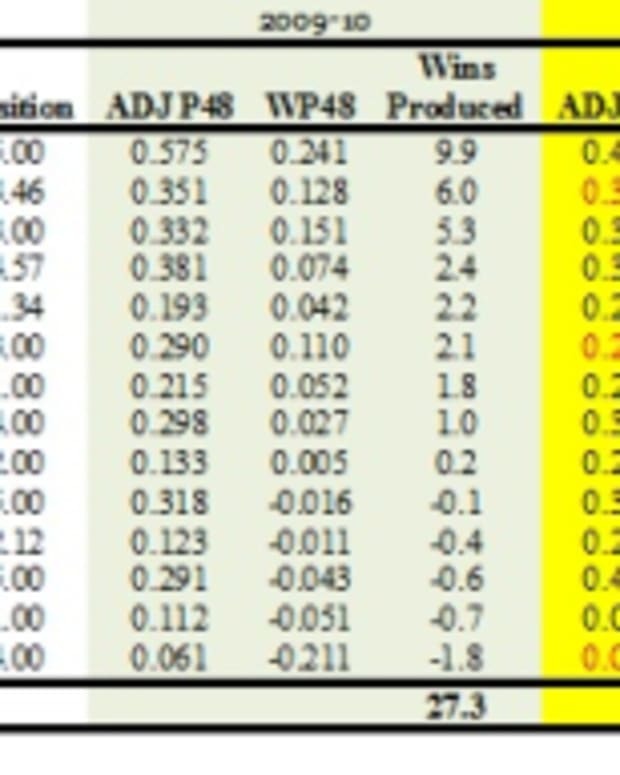 While what we’ve seen on the whole is better than what we’ve seen historically (at least a little bit anyway), the past several games have been relatively poor – and that up and down play is something that’s plagued Rodney his entire career. Three games of brilliant play followed by seven of mediocre or worse. 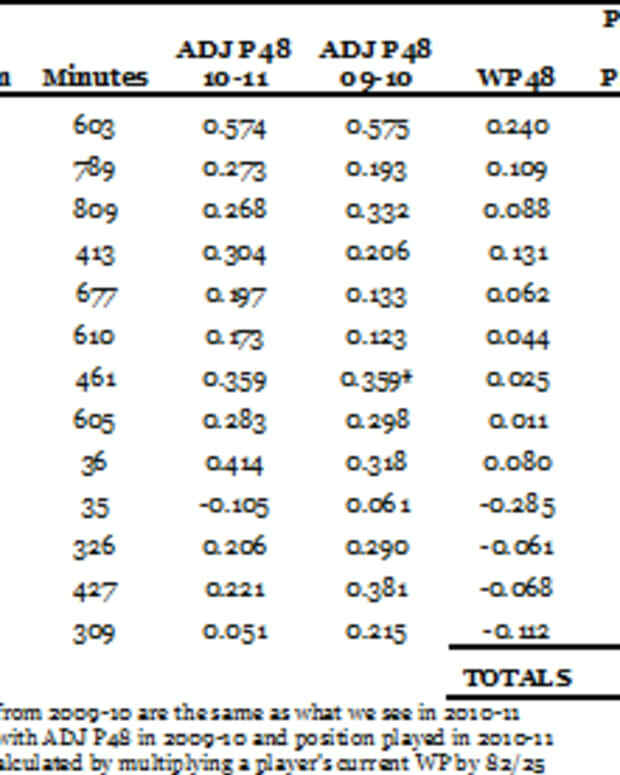 Austin Daye is not a PF. He’s playing most of his minutes out of position (in spite of the automated numbers having him at SF 49% of the time), and he’s struggling mightily. It would be nice to see him get minutes at SF and SG, but that seems unlikely to happen barring a major roster overhaul. I’m still optimistic about his future, and he has dug himself out of the negative range of late. Still, it’s not what I expected. Ben Gordon is playing some of the best ball of his career and certainly the best we’ve seen from him as a Piston (barring the start of last season pre-injury). 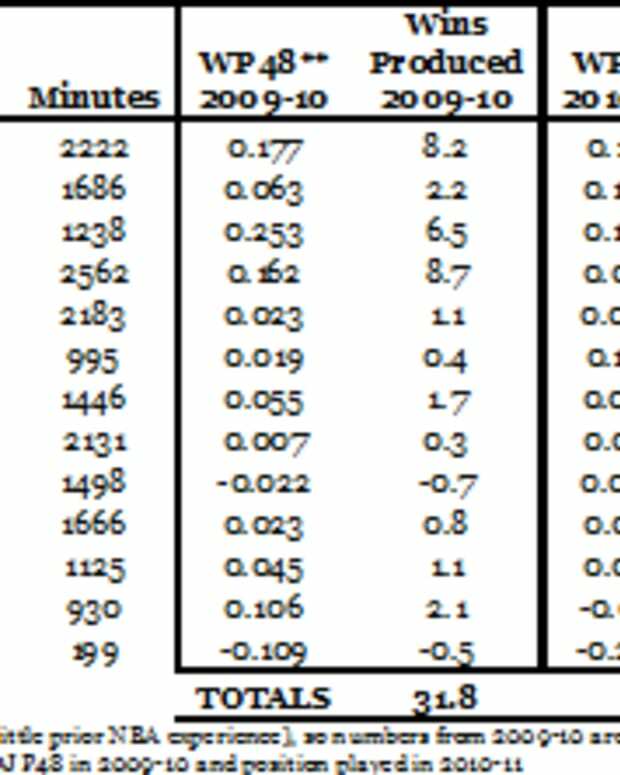 My only concern with Gordon is that his spike in productivity has been tied to almost superhuman shooting percentages for a guard whose game is predicated on jump shooting. Can he keep burning up the nets, or will he eventually cool off? Charlie Villanueva: in spite of shooting the ball and scoring very well, Charlie’s not having the career year I’d hoped for, at least not yet. This is largely due to the fact that he appears to have an aversion for rebounding the basketball, and rebounding – especially from your big men – matters. Tracy McGrady has made me enjoy eating crow so far. He’s looked much better than I thought he could, and that’s been reflected in the numbers. Per minute, he’s been the second-best player on the team; unfortunately, he hasn’t been able to play big minutes, and it’s not clear if he will. In any case, I had him completely wrong. Greg Monroe: after a miserable start, Monroe continues to play … well, not that good. However, he has been a much better rebounder than I anticipated, which is an excellent sign. He’s struggled to finish around the rim (and, well, from everywhere else, too), and he doesn’t look like he’ll ever be a shot-blocker. But he’s showed that he can and appears to have a desire to rebound the basketball, and that’s a good place to start. Rip and Tayshaun: Ugh. I’m not sure what else to say. They look miserable on the court, both in terms of demeanor and performance, and the numbers don’t provide any consolation. As much as I’ve pulled for these players for the better part of a decade, it appears their time in Detroit is coming to an end quickly. Ben Wallace: The Benaissance continues! That is all. Can our productive veterans (Big Ben and Tay) stay healthy and productive? Yes (!!) and no respectively. Can some of our new pieces (McGrady, Gordon, Charlie V) return to form? More than yes, more than yes, and not even close. Can even one of our young players (Daye, Stuckey, and I’m adding Monroe) take a significant step forward? Not yet. Why Were Pistons Bad Last Year? 2010-11 Pistons: What is Joe Dumars Doing?